Dagny McKinley has worked for Spin Magazine, Paramount Pictures and Sierra Club Productions. She gave up a career and a suit for an opportunity to volunteer in Yosemite National Park. Three seasons as a back country ranger and she fled city life, ending up in Steamboat Springs, CO. After earning her MFA in Creative Writing at Naropa University in Boulder, CO, she returned to Steamboat Springs to embark on the unexpected adventure of dog sledding. For the last three years she has been helping run tours for Grizzle-T Dog & Sled Works. While she initially sought out the job as a means to balance out her days of torturing her mind in front of a computer, she ended up falling in love with the dogs, bringing one home and finding 100 of the best friends she’s ever had. 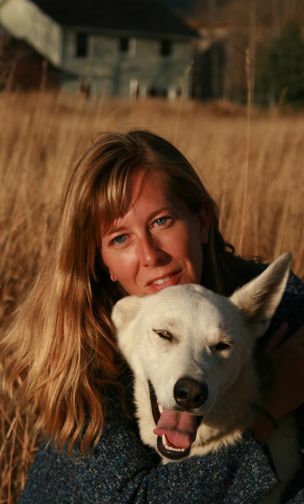 Her book, Wild Hearts: Dog Sledding the Rockies is an offering of McKinley’s reflections and her experiences with these incredible animals. McKinley spends her time exploring mountains and wilderness, writing fiction and loving her sled dog Alma Rose. This website was created to bring together my passions, exploration, environment and writing. Feel free to contact me with any thoughts or questions you might have on this site. Dagny McKinley has an MFA from Naropa University’s Jack Kerouac School of Disembodied Poets and Writers, founded by Allen Ginsberg and Anne Waldman, and a BA from the University of Western Ontario. She has also studied journalism and writing at UCLA. She currently works as a freelance writer in Santa Fe, NM. Her concern over the negative effects of pesticides led her to developed alternative-lawncare.com to educate people about the harmful effects of pesticides. As a journalist, Dagny has contributed to Steamboat Magazine, Mountain House & Home, Homelink Magazine and DCD Home. Most recently, Dagny has published the book Wild Hearts, Dog Sledding the Rockies a coffee table book of photography and text based on her experiences over the last two years working for a dog sledding company. Dagny is the author of Audrey Rose, a long running column about a free spirited girl finding her place in a town while her heart lives in nature. Her short story Nylon Screams was published in Fear Knocks. Her work regularly appears in cliteraturejournal.com. A Soldier’s Peasant was published in Di Algo Para Romper Este Silencio, an anthology celebrating Raymond Carver. Her poetry has been published by Subway Chronicles and Banshee Studios. Her play The Eccentricities of a Butterfly was produced by The Great American Laughing Stock Company. Her story Pray was performed by Stories on Stage in conjunction with the Denver Art Museum’s HotDAM events and Denver Center for the Performing Arts actors.